Color blindness is a condition in which a person has a defect in the eye that causes an inability to identify various colors and shades. Red means stop. Green means go. It is one of the earliest lessons a child learns. But for more than 10 million people in the United States, this is not as simple as it sounds. These people usually are called "color blind," although it is more accurate to say that they have poor color vision. How Does Color Blindness Happen? Color blindness almost always is inherited from the mother's genes. It affects boys most often, as girls usually have additional genetic material that overrides the vision problem. About 1 in 12 males has some degree of color blindness, whereas only about 1 in 100 females has it. People with color blindness often have no other vision problems, but color blindness is sometimes a result of other eye diseases and vision problems. The human eye can identify more than 8 million shades of colors. But the ability to distinguish among the colors begins with the three primary colors * of light: red, green, and blue. Just as a person can mix the color brown by coloring the same area with red and green crayons, the eye sees various colors by combining primary colors. As light passes through the eye, it focuses the image on the retina. The retina contains layers of cells at the inside rear of the eyeball and acts a little like the photographic film in a camera. The retina contains millions of receptors called "rods" that help see light and "cones" that help see light and colors. When light strikes the rods and cones, chemicals are released. * primary colors are sets of colors that can be mixed to create all other colors. There are two kinds of primary colors: subtractive or colorant primaries (red, blue, and yellow), which refer to pigments like crayons; and additive or light primaries (red, blue, and green), which refer to light. People with poor color vision have cones that do not function properly, because they do not release some of the chemicals when they are struck by light. As a result, these people see only certain colors and shades. The most common form of color blindness is difficulty in seeing the colors red and green properly, or the same way most people see them. The condition can range from mild to severe. Sometimes a person simply cannot see the colors as vividly as a person who has normal color vision. Other times, there are areas that seem to lack color and to appear in shades of gray. Rarely does color blindness mean that people see everything in shades of gray, as in black-and-white photographs, movies, or television shows. 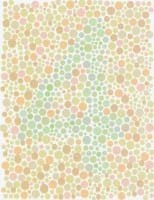 How Is Color Blindness Diagnosed and Treated? The first signs of poor color vision may be noticed in school, when a child starts to learn to identify colors. A simple vision test can determine if the problem is color blindness. An image made up of dots is shown to the child. It may be a number (4, for example, as in the illustration at right) made up of green dots on a background of yellow and orange dots. If the child cannot see the green numeral 4 distinctly because it appears to blend in with the background, he may have color blindness. There is no treatment or cure for color blindness. People are often taught to recognize colors in other ways. For example, traffic lights usually have the red light on top and green on the bottom. Here is a test. People with color blindness may see only colored dots. People without color blindness probably will see the number 4. Lighthouse International, 111 East 59 Street, New York, NY 10022. The Lighthouse International website posts fact sheets about vision problems, color contrast, and partial sight.